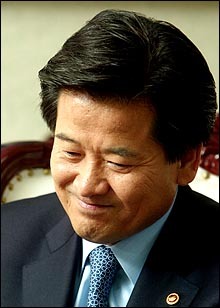 Unification Minister Chung Dong Young, in a Dec. 2 interview with OhmyNews, said he found it "unfortunate and regretful" that inter-Korean relations have stalled following the ministry's nixing of plans by civic groups to send a mourning team to Pyongyang to commemorate the 10th anniversary of the death of Kim Il-sung and the airlift of 460 North Korean defectors from a Southeast Asian nation to Seoul. This is noteworthy as it's an official expression of regret from the Southern side to the Northern one over the two incidents. 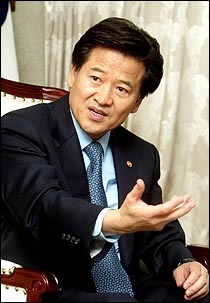 Chung said, "From the North's position, it's understandable how it might take the mass airlift of defectors from a third country as something seriously threatening to their regime... With that in mind, I think it's extremely unfortunate that several sensitive issues that could be taken as threatening to the North Korean regime have popped up in succession. I think it's extremely regretful that because of this, North-South relations have stalled and have suffered a snag." Asked by an OhmyNews reporter whether he thought as Unification Minister whether a North-South summit was possible within a year, Chung said, "2005 is a really important year for North-South co-existence and co-prosperity... I will do my best so that 2005 could give hope to our people, and as a result of those efforts a North-South summit takes place." "Constant talk of summit proof of desire of epoch making development in inter-Korean relations." Minister Chung said, "That there is frequent talk of a summit or special envoy to North Korea is evidence of the expectation and earnest desire for epoch-making progress in inter-Korean relations. A summit would be very necessary, both ethically and substantively, for peace and stability on the Korean Peninsula." 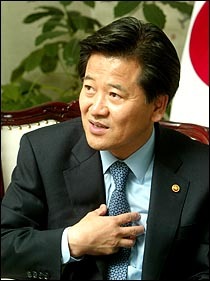 When asked by the OhmyNews reporter whether it was acceptable to take Chung's comments as meaning he would, as unification minister, do all he could to see an inter-Korean summit held in 2005, the minister responded, "If the government were to strive and satisfy the expectations of the citizens, there would be no greater honor." This is drawing attention as the first expression of a hope to hold an inter-Korean summit in 2005 by any government official. 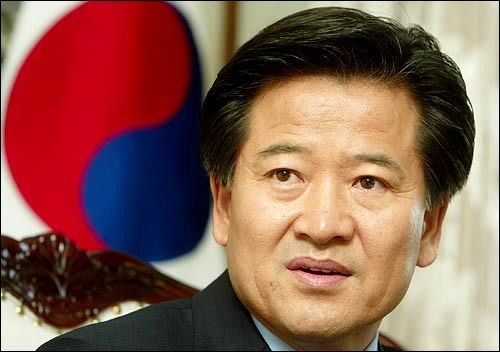 About the significance of last month's Korea-U.S. summit meeting, Chung said, "President Roh Moo Hyun's speech in Los Angeles contained the concerns and worries of the leader of one nation... Roh's speech in Los Angeles and Korea-U.S. summit that followed one week later were decisive milestones in the long process of resolving the North Korean nuclear issue." Asked to evaluate his own performance over the last five months, he said, "Considering that there hasn't been much dissention between ministries involved with unification, diplomacy and security, I think I might be doing well." Minister Chung gave an hour-long exclusive interview with OhmyNews in his office on the fourth floor of the Central Government Complex on Sejong-no, Seoul from 11 a.m. Thursday. It was the first official interview with the media Chung has given since his appointment as minister on July 1. OhmyNews requested the interview two months ago, and it has now been granted five months into his official duties. The following is a translation of the original interview. OhmyNews: It's been five months since you were appointed. How do you evaluate your performance? Chung Dong Young: The Minister of Unification must handle Korean issues and international issues, and I think I've done my best. There are many things I regret [not having done], but I think that as there hasn't been any discord between ministries over unification, diplomacy and security, I think I've done a good job. In particular, securing 500 billion won in funds for inter-Korean cooperation through the National Assembly's Budget Committee is not an easy thing to do, but I think I've managed to get it through." I heard you pray everyday before going to work. What is the biggest difference between being a politician and serving as minister? I think being a public servant is a bit tougher (laughter). Because you're somewhat free being a reporter, and you're not really tied down as a politician, either. With this in mind, my personal feeling is that since I'm serving in an official capacity with this government, it seems I'm a little more confined to formalities. However, as both being a politician and being an administrator are forms of devotion to the public, they are essentially the same in that both require deep consideration and a heavy sense of responsibility. "Big achievement from Korea-U.S. summit... We still need a breakthrough"
Perhaps it's the same for all ministers, but because you occupy both the Unification Minister and Chairman of the National Security Council (NSC) chairs, it would seem that you would require close harmonization with the president. Is your communication with President Roh smooth? There have been no problems in communication. I think it's been smooth. Moreover, what are the most important problems of our era? As they are the issues of unification and a peaceful solution to the North Korean nuclear issue, they are the No. 1 things the president is always concerning himself with, and because of this, it's natural that I should closely discuss things with the president, the man with the highest responsibility for national administration in Korea. The last Korea-U.S. summit was evaluated in several different ways. If you were to explain to Internet users what the core significance of the last Korea-U.S. summit was, as unification minister, what would you say? Many people were concerned that the U.S. might take a tougher line following the U.S. presidential election. Moreover, one could believe that since the second North Korean nuclear issue began in October 2002, the U.S. has virtually ignored it. It has been adrift. People thought that perhaps we stood at a crossroad in which peace or war would be decided at the slightest of mistakes without regard for our position, and accordingly, groundless rumors of a crisis in the coming few months were going around. With this in mind, I think President Roh's speech in Los Angeles, which contained the concerns and worries of the leader of a nation, and the Korea-U.S. summit that followed a week later were decisive milestones in the long process of finding a solution to the North Korean nuclear issue. In principle, both sides agreed on the path to exhaust all their diplomatic means to resolve the North Korean nuclear issue in a peaceful way. That's what the leader of the nation must do, and considering how he was fortunately able to achieve his desired results, I think Roh did a great service for the Korean people. Even now, we need a breakthrough. It's been a month since the finish of the U.S. presidential election. In this situation, wouldn't it be serious if problems on the Korean Peninsula continued to flounder, move in an unreasonable direction, or go in a direction outside calls for a peaceful solution without regard for the position of South Korea, a party to issues on the Korean Peninsula? Another thing is that the four big pending security issues between the U.S. and Korea during the last one year and 10 months, which is to say the GPR (i.e., the redeployment of USFK), USFK reductions, the Iraq deployment and transfer of the Yongsan Garrison were each extremely sensitive, upon which national interests depended. I think that those issues are being successfully concluded, and during the course of resolving those issues, I think we've clearly conveyed our message to the U.S. side against a background of trust and confidence we've built up between Korea and the U.S.
"I tuned President Roh's speech in LA beforehand." 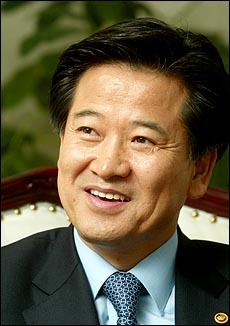 President Roh's speech when he visited the U.S. was quite a sensitive matter. Did you as chairman of the NSC and unification minister fine tune it beforehand? 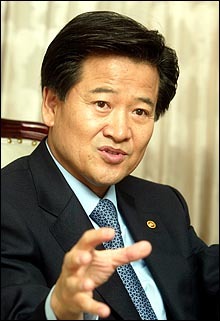 To speak frankly, President Roh dictated the speech directly. In the process of fine-tuning the speech, however, advisors including my self were present. Moreover, the gist of the speech was to organize and convey what President Roh has been saying every chance he's had for quite a long time. The president had given sufficient concern and deep thought to the speech's content. When did you get the chance to prune his speech? About three days before Roh left the country, I was curious about what was in the speech, and when I went to confirm it, a rough draft was already completed. I asked the presidential secretary whether I should take a look at it too, and received a copy. The other NSC members and I reviewed and fine-tuned it. What response has North Korea had to this South Korea-U.S. summit? If that is the mood, does it appear the six-way talks to solve the North Korean nuclear issue, which have been stuck, might proceed more smoothly than before? We are working with that positive and optimistic attitude. Unfortunately, the Roh administration was launched within the vortex of the North Korean nuclear issue. It was launched amidst rain and fog, but for the last two years it has plied its way through the rain and fog, stably managing situations and making its routes. Looking back, the situation in the first three months of 2003, right when President Roh was inaugurated -- the situation leading up to the Iraq War -- was a very dangerous one. With the last two year's progress as background, if we work seriously, the North Korean nuclear issue must be resolved... it has no choice but to be resolved. In fact, if this chance is missed, other voices in the international community will clearly grow louder, and it will be quite difficult for the Korean government alone to block voices calling for another solution method. With this in mind, I think it's terribly important that North Korea not miss its chance to make a strategic resolution. There are some who say that since the Roh administration began, North-South relations have more or less regressed. So it appears North-South relations have stalled up to now. There's also the view that starting from when the Roh administration permitted the special investigation into the funds sent to North Korea ahead of the 2000 inter-Korean summit, a fissure has appeared in mutual trust between the Koreas. What do you think? The Roh administration has taken as its policy base a peace and prosperity policy that says we must move forward through co-existence and co-prosperity for a policy of inter-Korean reconciliation and cooperation. I don't think we've taken a step back from the Kim Dae Jung administration. In the history of inter-Korean relations, there have always been progress, stagnation, and temporary congestion. We stress once again that the investigation into the remittances was fundamentally an internal one of uncovering whether an actual law had been violated; it was not aimed at the North, nor was there any intention to cause damage to the inter-Korean relationship. "The cancellation of the Kim Il-sung condolence team and defector airlift were unfortunate and regretful"
The cancellation of a plan by civic groups to send a condolence team to Pyongyang for the 10th anniversary of the death of North Korean leader Kim Il-sung and the airlift of about 400 defectors from a third country in Southeast Asia to South Korea were factors in the North Korea's change in attitude, and since then there have been few signs that it may ease up. There are some who wonder whether these incidents may have unnecessarily provoked the North. As unification minister, it's your position that no matter what, North-South dialogue must free up once again, so don't you have any thoughts to directly apologize or express regret for the incidents? I was appointed unexpectedly on July 1, and from that time, several bad factors in the inter-Korean relationship have cropped up in succession, and at the same time. From the time I was a journalist, I often heard that if you went somewhere and a lot happened, it was a blessing to have so much to do. And when I was a politician, there were many more noisy times than quiet ones. Anyway, after I was appointed, I understand those who say I should have thought a little more about how seriously the North would take the cancellation of the consolation team to Pyongyang. Afterward, from the North's position, I understand how the airlift of a large number of defectors from a third country might have been taken as a serious threat to the North Korean system. With that in mind, I think it's extremely unfortunate that a number of matters that could be taken by the North as threatening to its system unexpectedly popped up in succession, and I think it's extremely regretful that because of those matters, inter-Korean relations have stagnated and suffered setbacks. We must return to the original spirit of the June 15 Declaration, and when problems such as these appear, we should sit down more, talk, and wisely sort them out. When we're able to overcome these issues, the inter-Korean relationship can be built upon a rock. Wind can always blow, and it could get cloudy or foggy. In this situation, we must not waver and move beyond reconciliation and cooperation to co-existence and co-prosperity, and with this in mind, the recent period could be positively viewed as a time of tempering. To speak once again of the defector issue, the government clearly opposes organized defections. For the people in the North to live their lives in the North with their families is necessary both for individuals and for co-existence and co-prosperity. The policies of reconciliation and cooperation call for humanitarian aid to the North along with strengthening of economic cooperation, and continuous pursuit of North Korea's participation in the international community. This policy is clearly diametrically opposed to any intention to absorb the North or make it collapse. To stress this clearly one more time, we don't want North Korea to collapse. With this in mind, it is not desirable for anyone to organize defections, intentionally bringing people out of North Korea. In particular, this runs counter to the government's policy of co-existence and co-prosperity. I think I've expressed my position sufficiently. These incidents have been unfortunate from the point of the total interests of the Korean people. We must use this precious time to boost inter-Korean reconciliation and cooperation, but despite the achievement made after the June 15 Declaration, the relationship has been retarded and stuck. Of course, in the civilian sector, some have kept up exchanges and cooperation and maintained momentum, but it has still been unfortunate. I earnestly hope we can get this all in order within the shortest time period possible. Is there anything you want to particularly stress? The people of the Republic of Korea also have feelings, and in pushing inter-Korean cooperation, there needs to be consensus and public support within the South. With this in mind, even while I stress the importance of inter-Korean reconciliation, there is a grim reality in the South. From our position, we must understand how sensitively the North could take incidents like this, and the North must also understand that within the South, there is no complete, firm and unified opinion about inter-Korean reconciliation. North and South must understand one another more and try to see things from each other's position. You've said we must build mutual understanding and trust. Is there a particular countermeasure our side has prepared to break the deadlock? There has been much progress in negotiations over technical barriers to the Kaesong Industrial Zone, and last week, working talks for building a reunion center in the Kumgang Mountains. I think these things are signs that things are carefully thawing. I will accelerate things and get North-South dialogue in operation. "I will work for an inter-Korean summit in 2005." Rumors keep appearing in the media about an inter-Korean summit or the dispatch of an envoy to North Korea. In fact, if there were to be a summit sometime, it would be necessary to send an envoy. Are any specific preparations being made? That there is constant talk of a summit or envoy is proof of our citizens' expectations and ardent desire for epoch-making progress in the inter-Korean relationship. A summit would be very important and necessary, both ethically and substantively, for peace and stability on the Korean Peninsula. When the June 15 summit of 2000 took place, North Korean leader Kim Jong-il made a determination. There was much preparation and mood making. We have to keep our promise then that there would be a return visit by Kim Jong-il to Seoul. How fast is the world racing? I need not stress further how keeping that promise is necessary so that 70 million Koreans can join the currents of radical global change. In this context, I agree with the necessity of an envoy. Yet considering there are several realistic conditions owing to problems with the other side, we will carefully consider things and move forward. At this juncture, there is nothing concrete we can report. In late December, you are going directly to China. Is this related to either a summit or special envoy to the North? In order to support the historically significant Korea-U.S. and Korea-China summits, we need follow-up discussions. With that in mind, Korea-China cooperation is essential. Of the current participants in the six-way talks, the one with the most power to get North Korea to sit down at the six-way table in China. The interview questions are constantly focusing on a summit, so it seems 2005 is really important. At a crossroad between opening a highway of co-existence and co-prosperity in which there is peace and prosperity where the sunlight shines through the dark clouds hanging down over the Korean Peninsula, or continued wandering around amidst the clouds and darkness, this year is a year of terribly important significance. I will do my best to satisfy the people's hopes in 2005, and I hope a summit comes about as a result. If a second summit takes place, the people of the world will be happy. The first and second times are the tough ones; I expect things to get easier after that. May I take this as meaning that you will do everything you can as unification minister to bring about an inter-Korean summit by 2005? If the government can strive and satisfy the expectations of the people, this would be the biggest honor. "Resolve the nuclear issue and promote inter-Korean relations at same time"
We have to solve the issue of bringing strategic goods into the Kaesong Industrial Zone, but the U.S. attitude has been persistent. What's your plan to get the Kaesong Industrial Zone moving? The first thing I have to do as minister is peacefully resolve the North Korean nuclear crisis through the six-way talks, while another pillar is getting beyond the Cold War through the Kaesong Industrial Zone, getting beyond the Cold War on the Korean Peninsula through the economy. The Kaesong Industrial Zone is itself a project, but if we expand its meaning, it's a test and stepping stone that could move on to a Korean common economic zone. To start with the dream, if we can bring together Kaesong as a manufacturing zone, Incheon and Yeongjong Island as a transportation and circulation zone, and Seoul as a financial zone, it could be an East Asia hub that outstrips Shanghai's Putong. There have been problems and obstacles both big and small, and there will be more in the future, but I think we've overcome everything well up till now. It will also be possible to more or less overcome obstacles that appear in the future. The government has been saying that without a solution to the North Korean nuclear issue, epoch-making progress in inter-Korean relations would be difficult to achieve, and has directly and indirectly stated its policy that the North Korean nuclear issue must be solved first. About this, there has been criticism from civic groups. At this juncture, we need the mood to change in several ways, so how do you think a solution to the North Korean nuclear issue and progress in inter-Korean relations are related? To speak bluntly, we do not argue the two are related. It's not the government's position that the North Korean nuclear issue be resolved first. It's that both a solution to the nuclear issue and progress in inter-Korean relations be pursued at the same time. From our position, we think bringing progress in inter-Korean relations helps in solving the North Korean nuclear issue. It's just in principle, but between South Korea and the U.S. as well, it has been reported that there is agreement that progress in inter-Korean relations will help in resolving the North Korean nuclear issue. In particular, through this last Korea-U.S. summit, the argument that both should be pursued simultaneously was firmly established as both our governments' principle and strategy. It calls for taking the results of the Korea-U.S. summit and connecting them to the start of normalizing inter-Korean relations, and then with the normalization of the inter-Korean relationship in the background, promoting the peaceful resolution of the nuclear issue through the six-way talks. The government's position is that the two projects must be made to promote one another, not to be mutually exclusive. In order to do this, we need active cooperation from both the South and North. Any time North Korea has opened its mouth, it has talked of cooperation within the Korean people, but what does this mean? We need to have dialogue in order to peacefully resolve the North Korean nuclear issue. In order to do what you've talked about, we must regularize the inter-Korean relationship as soon as possible. 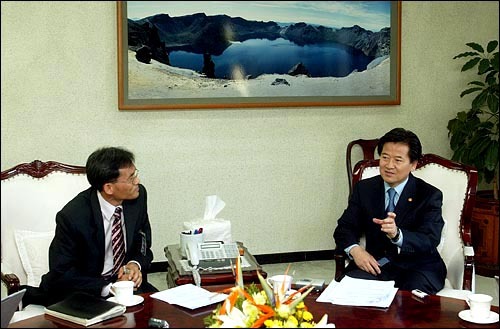 Unification Minister Chung Dong Young (right) answers a question from OhmyNews founder Oh Yeon Ho, at Chung's Central Government Complex office in downtown Seoul, last Thursday.